LIN (Local Interconnect Network) is a serial network protocol which is characterized by a master-slave architecture and transmission patterns. The master regulates the bus access and controls the communication of up to 16 participants. Only when the master prompts a slave, the latter is allowed to transmit its stored information. On each request of the master, answers defined within a schedule table follow in a fixed time sequence. LIN was introduced by five automobile manufacturers in 1999 and further developed under the supervision of the LIN Consortium. Until today, the LIN bus has proven itself to be a cost-effective alternative to the CAN bus for networking sensors and actuators in vehicles, such as seat, door, mirror, and climate controls. 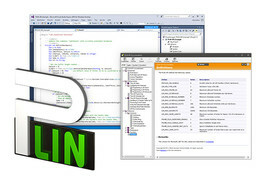 The programming interface PLIN-API (PEAK LIN Application Programming Interface) enables the connection of Windows® applications to the LIN bus. The API provides various functions for developers in the programming languages C++, C#, C++/CLR, C++/MFC, Delphi, VB.net, and Python 2.x. The PLIN-API is designed to be used exclusively with a PC LIN interface from PEAK-System.